Our travel day was, for the most part, uneventful…everything went as planned. We only missed one train, due to our error of boarding a first class car by mistake, and upon realizing it, hopped off but by the time we reached the second class section the train was closing up and leaving the track. Not to worry, another one arrived within 30 minutes which took us from the Frankfurt airport to the center of Nuremburg. The ICE train is so quiet and smooth we got a little too comfy and kept falling asleep during the 2 hour trip. 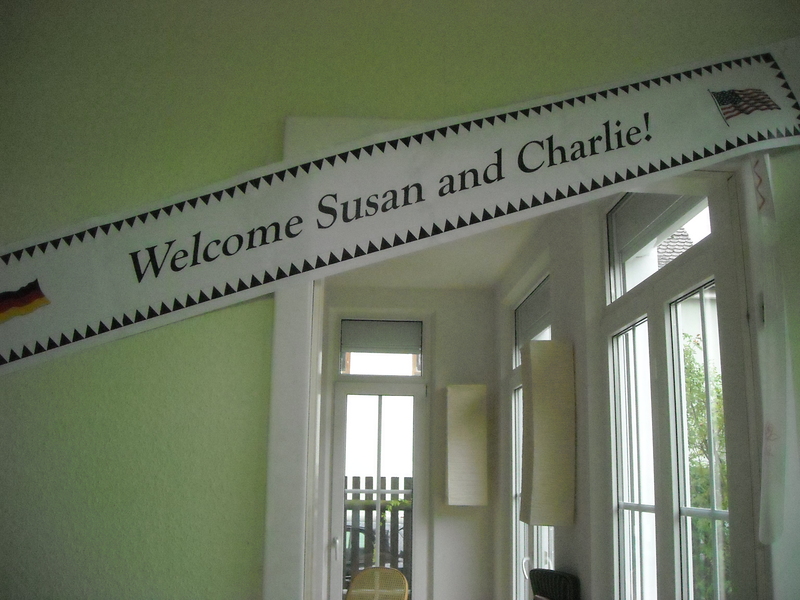 After very little sleep on the 9 1/2 hour plane ride, fatigue was starting to settle in but upon arrival we perked up when we found Andrea who drove us to the house in Zirndorf, a mere 15 minute drive. She is Ruediger’s girlfriend who lives only a few blocks from Ruediger’s place and showed us all his electronic gadgets and how to make coffee, which requires checking the Google translate site to remember her instructions. Several areas of the house have motion detectors which automatically light up as we’re walking through. No need for screens as threre are no bugs to worry about and it’s cool enough to leave them all open. Everything we need is within walking distance…grocery, restaurants, etc., so explored and ate in a little Italian place – pizza is very popular over here, just don’t order one with pepperoni as that word has a different meaning and you will get hot peppers – if you want the pepperoni we are used to, order it with salami! We forced ourselves to stay awake til 9 and then crashed, sleeping almost 12 hours. This morning we feel fine, no jet lag, and ready to roll. Looking forward to exploring Nuremberg and the old town this afternoon after a leisurely morning of coffee and Olympics. A couple of notes about the flight…a little disconcerting when we were delayed a bit out of Dallas as someone’s bags had been loaded but the passenger was nowhere to be found so had to wait til their luggage was taken off the plane. And, this will sound ageist and sexist, but do you remember when flying was kind of glamorous? Remember the Braniff flight attendants (stewardesses), cute, stylish…I swear all four of the flight attendants were older than me (meaning older than dirt)…one even reminded me of my mom with grey hair, curly perm…not that they don’t have the right to work but really felt bad watching them struggling with the food/drink carts up and down the aisles…and this was American Airlines with American attendants. Maybe I could have a second career as a flight attendant…they were even a bit short and pudgy so maybe I could get away with it! So glad you made it safely!! House looks wonderful and beer even better!! Have best time ever and keep blogging so we can enjoy the fun from afar! !